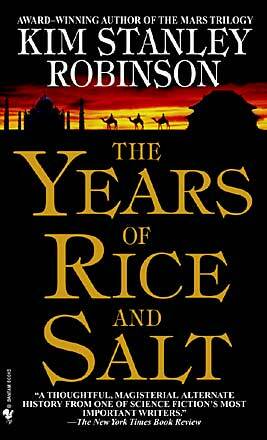 The Years of Rice and Salt is an alternative history novel published in 2002. Its working title was A World Without Europe. In the 14th century Anno Domini, the Black Plague decimates Europe. The Muslim, Indian and Chinese civilizations are the ones that will drive world history, through hardships and wars, discoveries and revolutions. It explores the shape the world would have taken if 99% of the European population had been wiped out by the 14th Century Black Plague. It follows 700 years of human toil and development unto a time where world civilization is one step ahead of our own. The Buddhist and Islamic religions take a prominent role; the civilizations that shape the world are the Chinese, Arab, Indian and Hodenosaunee (Native American). Through monologues, discussions between characters and parallels with our world, the novel explores the way history is made and discusses ideas on the evolution of history and the purpose of civilization (if any). More than a collection of short stories, the narrative follows a group of souls that are reincarnated into people that keep certain similar character traits and temperaments. The novel is divided into ten Books, each focusing on one (or sometimes more) incarnation of the main characters. It is written in the third person, with each Book roughly seen from a particular character’s perspective. Through the ages, a character’s name keeps the same initial letter so that the reader can identify him/her. Small chapters in the bardo, the Buddhist afterlife where souls meet between incarnations, occasionally serve as links between stories. Each Book has its own style, roughly following the style of the historical period or culture it depicts (most prominent in Books I, VI, VIII). From a Europe deserted by plague to Africa to China, the journeys of a Mongol warrior who meets an African boy who plans to kill the Chinese Emperor. One incarnation in rural Mughal India; then the journeys of a Sufi scholar from Mughal India to Akbar's court to Mecca to Europe being repopulated by Muslims. Circumstances bring a Chinese war fleet to land in America; Indian Americans end up contracting illnesses, and Incas end up getting shot at by the gold-thirsty Chinese. Between the Khan's demands and their own inclinations, Samarqandi scientists make a series of discoveries and inventions that amount to an Islamic Renaissance. A ronin that escaped chinese invasion of Nippon rises the more democratically-inclined Native Americans (Hodenosaunee league) against the Chinese and Muslim colonists. Against the backdrop of civil unrest and war between Muslims and Chinese at the Chinese border, two souls' discussions spawn a multitude of books on history, comparative religion, poetry and philosophy. Industrialization leads the South Indian League to large conquests, wealth and knowledge; against the great forces of Islam and China, Travancore seeks allies: the Hodenosaunee or the Japanese Americans. During the Long World War and the military campaigns in China and India, three chinese officers wonder whether this is the real world or the bardo. In a Firanja still recovering from the Long War and in great social crisis, especially in women's rights, two women fight for the formation of an impartial scientific council that could save the world. Following the Chinese revolution towards more equity, a Chinese wanders across continents, wonders at history and grows old in a world where Justice starts becoming a reality. See main article: Timeline of The Years Of Rice And Salt. The diverging moment in the novel's timeline seems to be the latter 14th century AD. The Black Death, which killed 30 to 60% of Europe's population, peaked around 1348-1350. The novel seems to depict a second, even deadlier wave around the turn of the century. The novel then covers around 700 years of history, ending in the future compared to our timeline, around the year 2088 AD. Since the Christian population is only minor, the Christian calendars (Julian or Gregorian) are not used in the novel. Instead, the Chinese imperial calendar, the lunar Hegira calendar and the solar Buddhist calendar are used throughout the novel. I just wanted to say that this is one of my favourite novels of all time, and to thank KSR for acknowledging how integral the Haudenosaunee where and are to the shaping of North America, and I salute his deep regard for my culture in thinking of how influential we could have been in a different world where we were not decimated by disease, warfare, and colonization. Hello KSR fans! I am embarking on an attempt to do one illustration from every chapter of The Years of Rice and Salt. Today I drew Bold the Mongolian raider, surveying a deserted town. Will I be able to make it to A.H. 1423? We'll see! Hi, I'm currently a student majoring in Religious Studies at Vanderbilt University. I recently finished reading [i]The Years of Rice and Salt[/i], and am wondering if anyone could help me identify several passages attributed to the Qur'an in support of reincarnation, found on pages 421 and 422. Among them: "God generates beings, and sends them back over and over again, till they return to Him;" "I tell you of a truth, that the spirits which now have affinity will be kindred together, although they all meet in new persons and names;" and "His body falls off like the shell of a crab, and he forms a new one. The person is only a mask which the soul puts on for a season, wears for its proper time, and then casts off, and another is worn in its stead." I know that some Sufis and a few Ismaili Shi'a sects believe in reincarnation, but this is the first I've ever heard of it being sanctioned in the Qur'an. I tried searching the quotes online, without any success. Is it possible they could be from the Hadiths instead? I would appreciate any help in tracking down the source of these verses. I can't imagine KSR would have simply made them up, considering the depth of his scholarship otherwise. Thanks. Is it possible they might be from the Hadith? I'll greatly appreciate any help I can get in identifying the source of these verses. 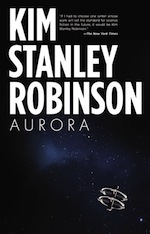 I can't imagine that Kim Stanley Robinson would have made them up, considering the obvious depth of his scholarship throughout the rest of the book. Thank you. I am no specialist, but I will try to find more information. "He gave you life; then will He cause you to die, and will again bring you to life; and again to Him will ye return." "I tell you of a truth, that the spirits which now have affinity will be kindred together, although they all meet in new persons and names"
This seems to come from "The New Koran", whatever that might be (Sufi? ).